Look around your house for an arrangement of objects that just happens to be there. Don’t spend too long looking. It could be things that you keep on a shelf, table or window ledge or a corner of your kitchen. Don’t choose objects that are too complex in appearance, but choose things that you find interesting to look at. Make any minor adjustments that you need to create a simple still life arrangement from what happens to be there. There’s not much going on in my apartment but a few simple things left around and kitchen utensils, I move that often that I keep things to a bare minimum. However I did have a handful of things laying around. The first objects that I laid my eyes on were my wooden manikin that I have never used and a Siamese football (taakraw) they were on a small white wooden table that I used in my assignment and other exercises so I placed them on a thin layer of wrapping material that was elevated with a plastic bottle to give the composition an interesting background. This arrangement had everything I was looking for really but I thought I would look at other things I had laying around. 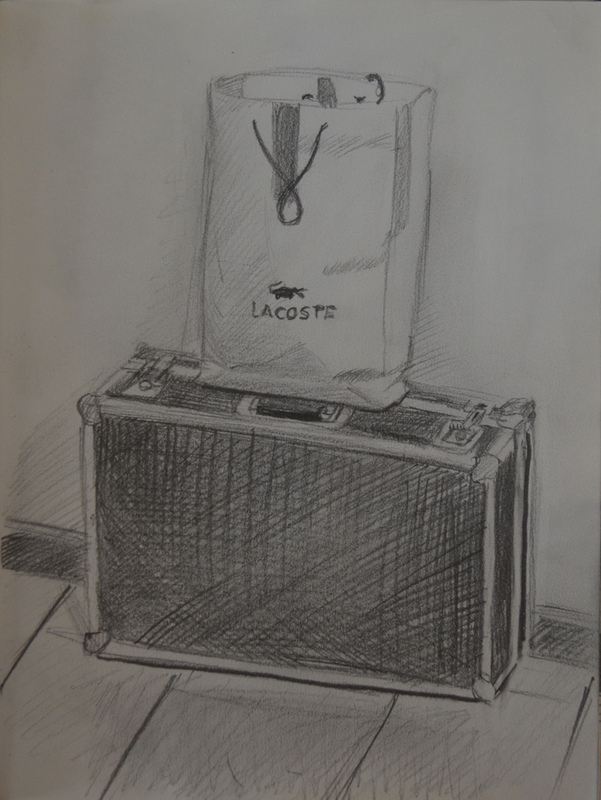 The second sketch was of a Lacoste shopping bag on top of a case containing a drone that I have never used. This was also an interesting composition and will be a subject for a painting at some stage but for this exercise it was quite technical with the detail on the case. 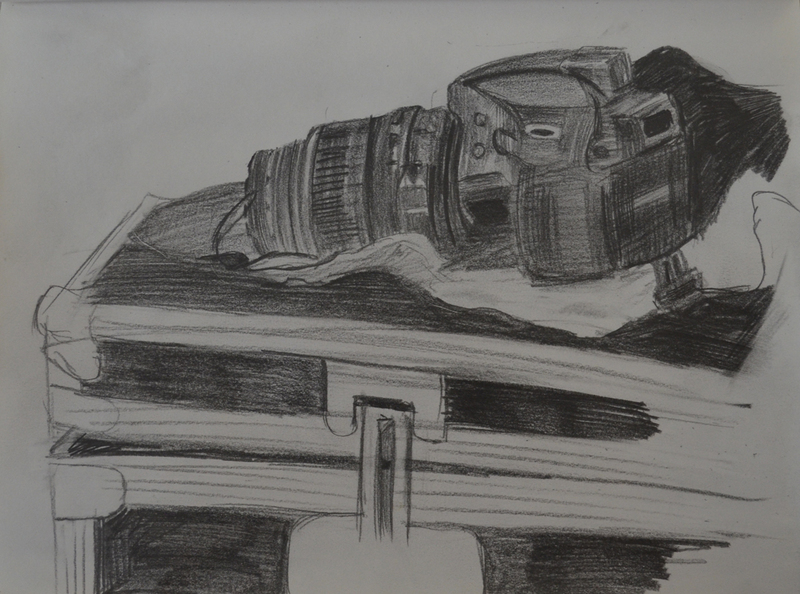 My third sketch was of my camera on top of the case containing the remote control for the drone, This was very technical and so I decided against it and left the sketch unfinished. 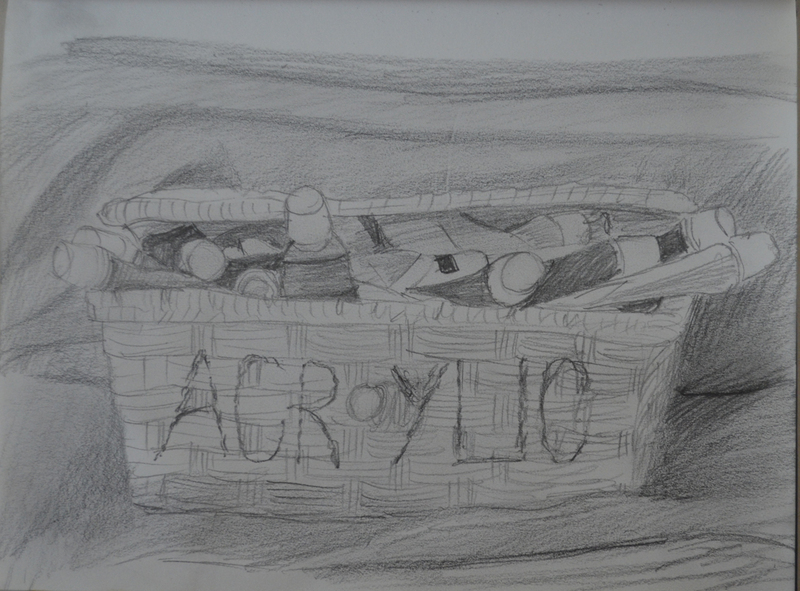 For the third drawing i set up a composition of my acrylic paint basket and some material used for monks robes that I bought for my drawing course. I didn’t know how it would turn out but I couldn’t have asked for a better result. This would have been ideal for this exercise with the lines of the fabric folded behind the box and how the lines seperated the different tones of the colours on the box inside the tube…BUT…I liked it so much that i wanted to save it for my still life with man made objects. Going back to the manikin and taakraw, I made the second sketch of my chosen arrangement in watercolour. I bought a watercolour set about a month ago and have been doing some urban sketching. I usually draw with a Rotring first and then do the rest in watercolour, this was my first 100% watercolour sketch. 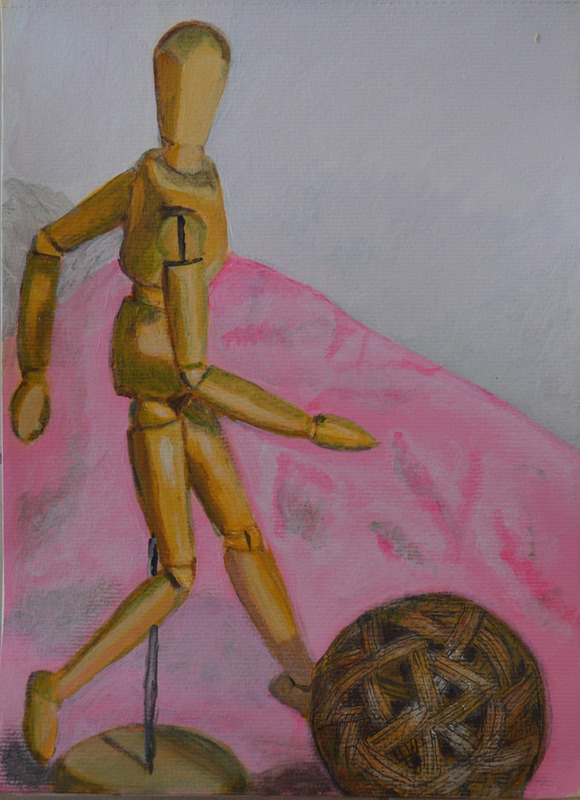 I started with the outline of the manikin and ball and then applied the colour followed by glazing for the shadow. For the ball I drew the outline in a fairly watered down mix then finished it off with a mixture of dry brush and glazing. I thought this would have given me enough practise for finishing off the ball in the acrylic painting but it proved to be much more difficult in acrylic. 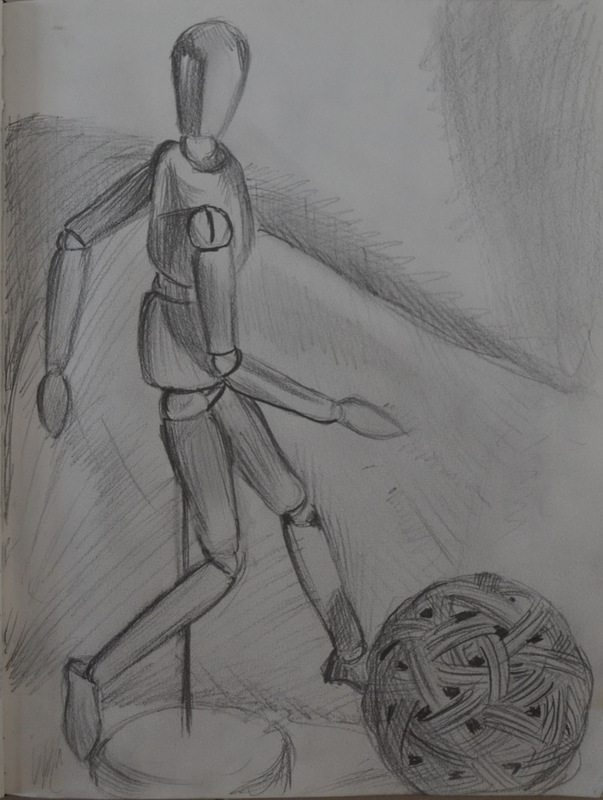 The composition looks easy to draw but it wasn’t, it actually took three attempts to draw the two objects in pencil due to the dimensions of the two objects together. So when it come to drawing in acrylic I tore out the watercolour sketch from the XL pad and put it in front of me with the pencil drawing so I could work from real life with the two drawings as reference. I started by preparing the paper with an off-white first coat of acrylic and then once dry I painted the outline of the two objects with a watered down mix of yellow ochre and burnt umber. From there I made a couple of edits before applying colour. Yellow ochre played a big part in the colouring of the mankin with different mixes of white for the lighter tones, then I used a mixture of dry brush and glazing techniques for the shadows and darker tones. My palette wasn’t too large but I did use a few different colours such as burnt umber, burnt sienna, yelllow ochre and titanium white (my tutor did warn against using titanium white but as of yet I have been unable to find zinc white here) as well as cadmium orange and chromium green. Although I applied the colour very randomly switching from technique to technique as I moved through the manikin, I did work in a very structured manner, like the Dutch Masters I painted the manikin piece by piece first the head then the arms, body and so on. 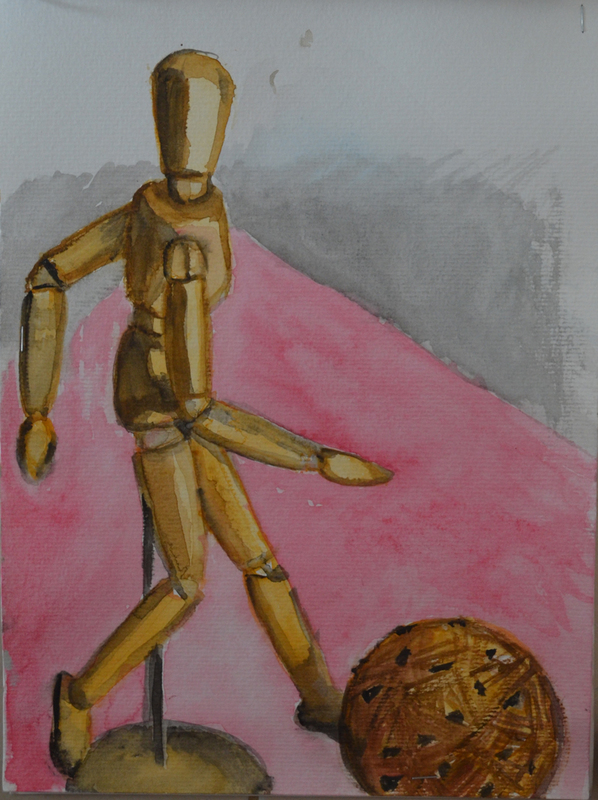 Once I had finished the manikin the drawing of the outline of the ball looked way out and so I painted in the basic colours of the background, pink ( a mix of primary red and white) and then a very light grey (black and white), this gave me a rough idea how much it needed editing, which wasn’t much. When working on detail of the ball it changed from a drawing with paint exercise to mixed media. Firstly I painted the light and dark tones of the ball and then I needed some kind of technique for drawing the woven sections. I came across ‘Hitofude Ryuu’ dragon with 1 stroke painting and thought maybe I could borrow something from this to paint the ball so I dipped a small flat brush in two different coloured paints, hoping that I could paint the detail of the weave as well as the shadow in 1 stroke. Unfortunately it didn’t work and I had to paint over it and start again but it was worth a try. Eventually I settled for a dry brush technique with a darkened mix of yellow ochre which worked really well but it still needed detail which I thought I could achieve with black applied with a small brush. The brush snapped when towel drying it and so I tried applying the paint with the blade of a cutter with no joy and so I made the decision not to paint the black detail but to draw it with a black Uni-ball pen. the result of this can be seen above. 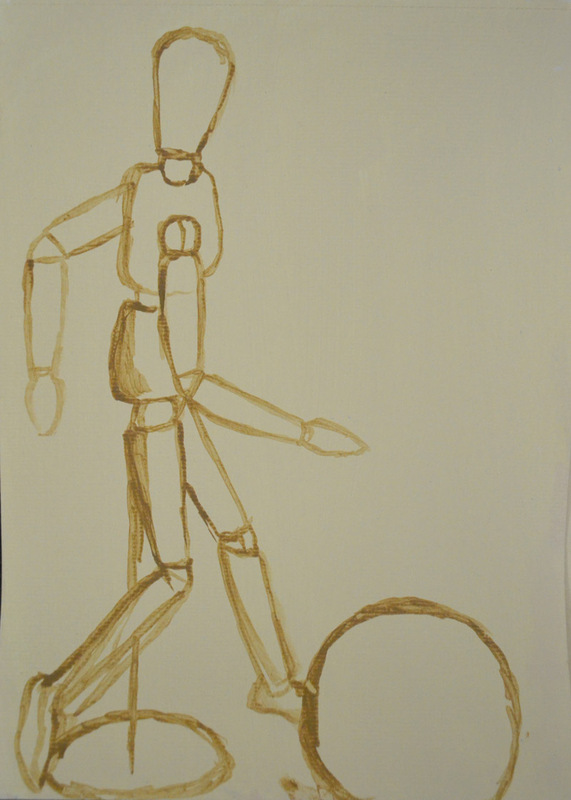 This entry was posted in 2 - Drawing with Paint, 2 Still LIfe, Coursework, Pt 2 - Close to Home and tagged art blog, drawing with acrylic paint, drawing with paint, drawing with watercolour, oca painting 1 course, painting blog, part 2 close to home, still life on March 9, 2015 by Mark A Smith.